Why do more AmLaw 100 firms use gwabbit than all other ERM/DQMs combined? It’s hard to do what we do for a living. Don’t take our word for it. Check our competitors’ references. Check ours too. Compare notes. How many competitive systems have been in full production for a year or more processing tens of millions of emails from hundreds of attorneys? gwabbit is a proven, ready-for-prime-time, industrial-strength ERM/DQM solution. It’s ready, today, to deliver more and better contact and relationship data to propel your firm higher in the AmLaw 100. gwabbit is serious. So are our clients. Did you know that the freebie ERM is the world's only ERM that doesn't include ERM reports? There's much more. 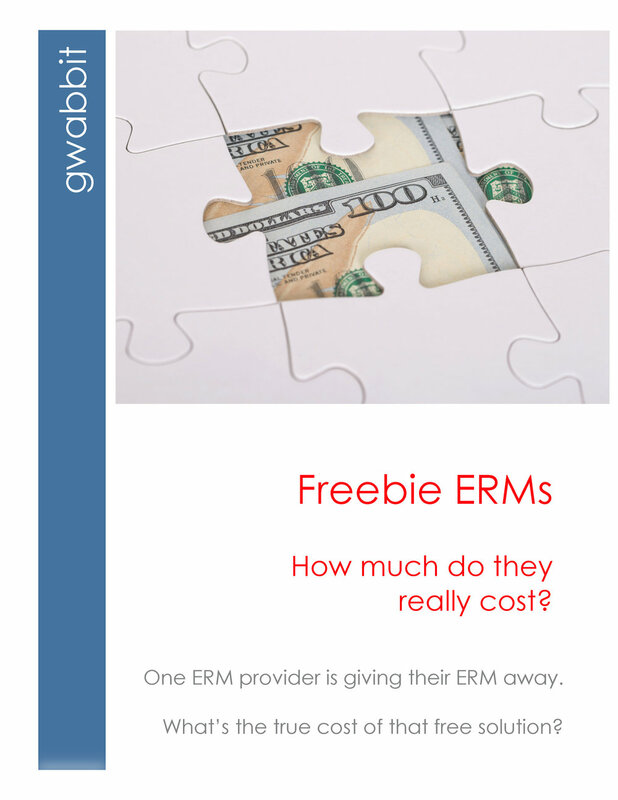 Download our report "Freebie ERMs: How much do they really cost"
How much do you spend every year on unused CRM seats? Find out how you can save tens of thousands of dollars annually while getting more high-value CRM data. ERM reports aren't included. Believe-it-or-not, the freebie ERM solution doesn't include ERM reports! Those are (way) extra. Data steward costs. gwabbit contact throughput is 10x faster than the freebie solution. 10x slower means 10x more data steward costs. Read about "the world's fastest data steward!" Believe-it-or-not, the freebie ERM solution doesn't include ERM reports! Those are (way) extra. gwabbit ERM 4.0 includes heat map, aggregate trend, and hyperbolic displays in addition to traditional contact and colleague contact and relationship lists. Search and refine by company, industry, geo/proximity, relationship strength, job title, and more, then export to Excel workbooks. You know why one AmLaw 10 firm recently moved from their freebie ERM solution to gwabbit? Because it browned out their Exchange server. No one ever celebrates when an email gets delivered, though if one doesn't arrive, that's a career-changing event. Unlike other solutions, gwabbit does not require a full-up Exchange journaling setup with mailboxes and associated CPU and memory requirements. gwabbit can scale, now, without adding expensive resource and risk to your Exchange environment. firms are changing crms -- is your erm compatible with your new crm? In the past 18 months, 13 gwabbit firms have either changed CRMs or are planning to in the coming year! Has your annual CRM maintenance bill gone up by double digits? Now you know why. gwabbit is compatible with all major CRMs. When the time comes for your firm to trade up to a new CRM, we simply unplug gwabbit from your old CRM and plug in to the new one. gwabbit is the world's only ERM/DQM solution that automatically enhances contact records with LinkedIn for report and data quality management. LinkedIn profile links are presented in gwabbit native reports, inserted into CRM records, and used to help solve the “John Smith” problem – connecting the dots between old and new contacts with common names. No other ERM/DQM solution offers this capability. Signature scraping is hard to do. gwabbit has been doing it longer than all of its competitors combined. Additionally, gwabbit’s unique ability to use LinkedIn for contact change management, enables it to identify and update far more contacts than with traditional methods. One newcomer to the ERM/DQM space claims to update your out-of-date CRM contacts by comparing your contacts against unnamed data sources (Data.com). If there really were a magical data source that would cleanse your CRM like presto, don’t you think everyone would be using it? Data.com isn’t really a CRM data-cleansing tool – it’s a sales and marketing lead source. The world’s leading firms have relied on gwabbit signature scraping for years to source optimal data to their CRMs. Why? Because no one sends emails with out-of-date signatures. Signatures captured by gwabbit are current as of the moment email senders hits the Send button. That’s why gwabbit is the world’s leading ERM/DQM, used by the world’s most prestigious firms and emulated by the world’s largest legal solution providers. In our “World’s Fastest Data Steward” webinar, Ice Miller’s Mercedes Potter was clocked processing InterAction contact updates with gwabbit at 540 contacts per hour – 35x faster than InterAction DCM! Case studies. Testimonials. Success stories. More AmLaw 100 firms use gwabbit than all other ERM/DQMs combined. Check our references. Check our competitors'. Compare notes.